I don't want to assume everyone here know #StartupSouth and what it's about. 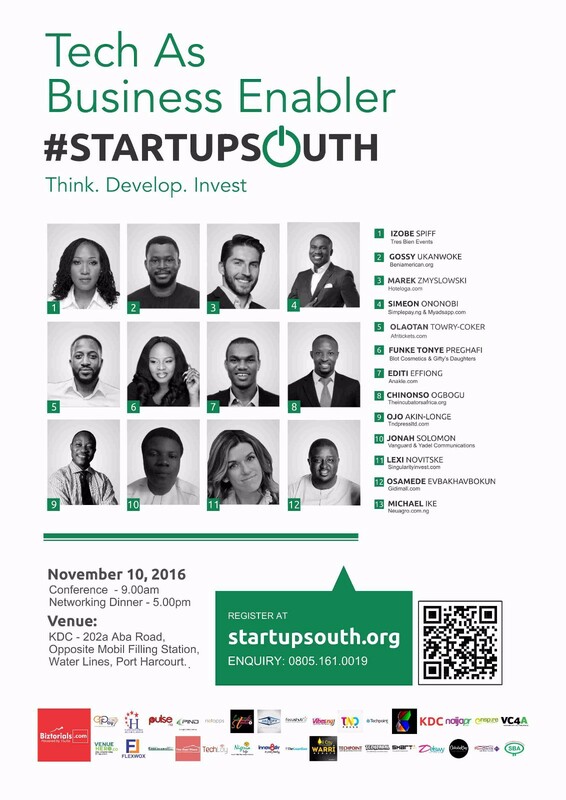 Startupsouth is Nigeria’s premier Startup Conference focusing on founders mainly in the South-South and South-East of the country. It’s main objectives is to educate, expose and possibly attract funding to founders in the states that make up these geo-political regions. More on Startupsouth including videos from last year here. Well, because Lagos already has all the exposure and in fact is believed to be (rightly so) the main startup hub in Nigeria. Some even think it’s the only one and it’s to help this second category of people that #StartupSouth was instituted. Another reason is to encourage local HNIs to lead the way in investing in early stage ventures as a tool to reduce youth related vices. At the end of the training ending with a mock pitch, 4 will be selected to pitch at #StartupSouth2. Each of them will get a free pass to the networking Dinner and possibly investments. 1. Social Media Presence: The thinking here was to demonstrate founders ability to utilize free resources for promotion. 2. Market Size: Is there enough potential users or custoners for the solution? 3. Scalability: How difficult/easy can it get to scale the idea. 4. Innovation: How innovative is the idea? Can it be replicated easily? 5. Relevance: How relevant is the solution both now and into the future. 6. Team: How compact and skilled the team is and their ability to progress solution to a more investible stage. 7. Traction: What level of progress has the team achieved on the solution so far? Product dev, user signups, Revenue. We received applications from Startups in 5States namely - Rivers, Akwa Ibom, Abia, Delta and Bayelsa. Our eventual goal is to cover 11States. We received entry from Startups operating in Agro-Alied, Fin-Tech, eCommerce, Edutech, Energy, Fashion and Entertainment. The following Startups have been shortlisted to progress to the next phase. Dresnice (www.dresnice.com) - Online Tailoring Shop that allows you to order and select designs and get it them made and delivered to you. Notify - Smart school solution that automates test/exams with integrated schools fees collection and reconciliation feature. Ioumoney (www.ioumoney.com.ng) - Online directory for loan providers in Nigeria. Mabiri (https://play.google.com/store/apps/details?id=com.mabiri.store) - find and buy item from local stores/retailers near you. Helping to bring more street corner shops online for the growing population of Smartphone wielding shoppers. Garden Groceries (No Website Yet) - An online grocery store that delivers fresh ORGANIC farm produce and products to corporate buyers using an ordering app and delivery support.